This volcano on the southern tip of the Big Island has been erupting continuously since, I think, 1983. Most of the activity is below the waterline much of the time but video taken by those adventurous enough to get close enough is quite spectacular. I’m reminded of the 1958 or 59 movie, Some Like it Hot. When you move in next to an active volcano you ought to have your head examined for cracks or be ready to take the heat. Sorry, I couldn’t resist. But honestly, if you were contemplating buying property there wouldn’t you do a little research on the history of that volcano and the chain of volcanoes that runs southeast from Midway to the Big Island of Hawaii? And as an added measure, maybe more important too, look into the accuracy of predictions about that and other volcanoes. Most of that chain of volcanoes never breached the surface so they aren’t easily discovered. But we now know there’s been a volcano at about that latitude/longitude over which the tectonic plate supporting all those volcanos has been slowly moving northwest. And every time the thing comes to life it causes a “new” volcano. And this time it has become an overachiever rivaling any other volcano in modern times that I know of. I’m no more sympathetic with those who build in a spot vulnerable to a volcano than I am with those who built foolishly in the Santa Monica Mountains. I wish they hadn’t done it and I hope they have good insurance. I’m gad that everyone who was or is threatened was able to safely retreat. But somewhere the buck has to stop and it should stop with the decision maker who signed off on taking the risk. I am surprised they don’t move the houses, before they become too threatened. The yanks have some remarkably able building movers, & by the looks of things, most of the houses you see consumed by the advancing lava would be pretty easy to pick up & move. I wonder how this volcanic pop will affect those oh-so important CO2 readings? Know doubt the very best assumptions, estimations, and approximations will be made. Tom this eruption was caused by Co2 if you believe them , one place in the world that I would expect to see Lava on a road would be Hawaii though . Mauna Loa will be off the charts! They will have to adjust it, like an urban heat island. Oh tom, don’t you know that only humans emit CO2. If volcanoes did it the Earth’s oceans would be boiling by now. I seem to nearly remember a scientific report from a few years back where the researchers found that old volcanic ash and lava, as well as ‘dormant’ volcanoes still vented considerable quantities of carbon CO2 into the atmosphere. I wonder if Hawaii has a special ‘Get out of CO2 jail free card’ that it uses (from it’s windfarms?). Why disturb them with the truth? We can safely let this be our little secret since it will make no difference anyway. As usual, elements of climatastrophism will claim this is due to a human-associated CO2 emission rise. I don’t know if any of you are familiar with Nick on the Rocks. His excellent videos on YouTube are about the geology of the Northwest US but the principles apply everywhere. Nick is an outstanding teacher. He makes two types of videos. Short ones that just explain what people are seeing on the surface or the history of a specific event and longer videos where he gets into more details about geologic functions or longer term events. Do you Aussies have a guy doing anything like what Nick is doing? I don’t pay much attention to the thumbs and the red thumb on this post about Nick on the Rocks shows why. I watched that video a short while ago RAH…I really enjoyed it and thank you for the link. I’ll be looking for more of his stuff. As for the red thumb…not worth bothering with the small mind that does that without explaining why. If I accidently knock the red, which my fumble fingers are apt to do, I immediately mention it. I’ve watched numerous of these videos. I’ve most enjoyed the ones about the Missoula floods – vast outbursts of glacial dam lakes towards the end of the ice age. They emptied the lake in days and tore away the terrain, including gouging out deep valleys in the flood basalts of the video you linked to. There are also great talks about the Pacific Northwest geology, such as the Cascadia volcanoes (Rainier, St Helens, Hood, etc), the lahars caused by their eruptions. All great watching for a late-blooming, part-time geology student like myself. Nothing like that RAH, we’re stuck with Malcolm I the middle. That makes sense, please name three most active Australian volcanoes (no NZ or PNG). Victoria is actually overdue for a volcanic eruption and interesting to me is oz has one of the handful of superdome volcanoes ,yes nothing going on now but plate tectonics suggest that sooner or later there will be an eruption again . Not for quite a few years though . Really Australia does have some interesting geology and it is a shame you don’t have someone like Nick to teach people about it. I wish some day I could come and see your unique land and peoples but I doubt it will ever have the opportunity. There is much that binds us in our two nations histories. Cyprus is very interesting geologically too. They now have a great geological museum based at Amiandos (Asbestos) mine site in the Troodos Mountains. That’s Malcolm IN the middle, a reference to an old TV show and our current PM’s position. I knew about the show but not it’s side reference to your PM. Let me guess, the environ-fascists are rushing to install extra thermometers there to replace those in much colder areas, or have they done that already? Climate Change causes earth quakes which cause volcanoes. Extreme events. All Climate Change caused by a 0.5C degree change. Apparently. There’s probably a lot of CO2 in that eruption, so we could have runaway Global Warming. Time to get out the canoes. resulting in an increase of volcanic activity. It should be obvious! Had to put a sarc tag on it because it does sound kind of convincing. Maybe i could apply for some climate funding to turn it into a thesis. The bit where i say “Carbonic acid caused by the CO2 then leaches into the geological structure of the the earths crust and weakens it” gave me goosebumps. Maybe i could get some crowd funding. Maybe a movie. In my opinion, there is already enough CO2 temperature related wiseacring. The idea that CO2 is dissolving the earths crust causing earthquakes seems fresh and something altogether new. The recent volcanic activity in Hawaii might just be the kind of phenomena needed to popularize this new theory. Maybe like the “China syndrome” movie. Major meltdown coming right at ya! It’s a funny thing about that movie. It was released twelve days before the Three Mile Island accident near Harrisburg PA, home of my blog site. When the accident happened, the, umm ‘even handed’ New York Times went into overdrive. In the news room, the senior editor asked who had seen the movie. When there was a small show of hands, that Editor then told them that they were the ones tasked with going there and reporting on it. The movie was their ‘research’. Assuming the crust is made of limestone – creation of nice caves – somewhere to send the “Warmists”. Let’s call them “stalagmites” because they “mite” (do) believe that volcanoes (igneous rocks) form in carbonate sedimentary rocks. You see in their eyes they have an “Armageddon-type religious belief that CO2 will bring planet Earth to its knees”. The reality about caves is that they often do collapse, hopefully just like the “Theory of AGW”. The “Warmists” just don’t seem to have grasped the fact that CO2 (which they have relentlessly demonised) and H2O are both GHG’s which are very important to life on Earth. The majority of the crust, that being the 71% which lies below the oceans, is made up primarily of basaltic igneous rock. As a lad I was wont to explore cave systems with old carbide lamps and rope.Wonderful stuff Orpheus! I shudder when I think about the situations I found myself in.Everything seems so pure – pristine if you like;the smell and clarity of sounds-even the silence. Leilani Estates. Leilani nearly won the Melbourne Cup. Leilani, the maiden sacrifice to appease the Volcanic Gods. Will the detritus from these eruptions have any effect on coral? Vs sunscreen!?! No Robber, this eruption has Tony Abbott’s finger prints all over it. This looks like a great opportunity to build a geothermal electric power station. All they need now is for their government to borrow money and they should be good to go. Mount Everest at 8850 metres [ 29035 feet ] reaches the highest altitude on Earth. The highest altitude being as measured above sea level. BUT from the sea floor to the sea surface, Mauna Kea rises another 6000 metres . So Mauna Kea in total vertical extent is about 10,000 metres high [ about 33,000 feet ] from sea floor to peak. Earth is not a sphere – it is an oblate spheroid. As an oblate spheroid, Earth is widest at its equator. Chimborazo is just one degree south of the equator. At that location, it is 6,384 kilometers (3,967 miles) above Earth’s center, or about 2 kilometers (about 1.2 miles) farther from Earth’s center than Mount Everest. And of course the daddy of all solar system volcanoes is Mar’s “Olympus Mons” , a shield volcano that stands close to 26kms [ 85,000 feet ] above the surrounding plains. In area it covers an area about 3/4′s the size of France. It [ Olympus Mons ] stands about 1,200 km (750 mi) from the other three large Martian shield volcanoes, collectively called the Tharsis Montes (Arsia Mons, Pavonis Mons, and Ascraeus Mons). The Tharsis Montes are slightly smaller than Olympus Mons. The Mt Gambier volcanic province is regarded as being dormant rather than extinct. Everest is even higher, if you count from the radius from the centre. It is just one of those silly facts, counting from an arbitrary base. It also depends on which one is closer to the equator and Hawaii wins. My favorite heights is the amazing average height of Antactica at 2500 metres, 8200 feet. More than half is higher than our highest point in Kosciousko at 2228 metres. The highest point in Antarctica is Mt Vinison at 4897 metres, 16,000 feet. The ice in Antarctica is on average 2km thick, an ocean on the surface but at Adelie, it is nearly 5km thick! (4776 metres), thicker than Mauna Kea is high. These extreme thicknesses and the consequent altitudes mean the South pole is 25C cooler than the North. 0.5C means nothing to a slab of ice 8000 feet in the air and up to 16000 feet thick. Now assuming ice has to melt from the top, melting ice which starts 8000 feet in the air is not easy. It is simply never warm enough where the North Pole gets to +20C, the South Pole only gets to -25C. That’s why the profiteers of doom concentrate on the North Pole. But the funniest fact, the one which startles, is that with the flattening of the poles and bulging at the equator, Antarctica is underwater, 21km under the sea level at the equator. It is really downhill 21km from the equator to the poles. Incidentally with a radius of 6371, as gravity goes like 1/r^2 you would weigh 2*21*100/6371 or 0.66% more at the poles. If it wasn’t for volcanoes, few of the pop up/fall down islands of the Pacific would exist. They are not continents and rise and fall. Or you can blame Climate Change. Sorry, I see you also consider distance from the centre with Mt Chimboraza. You will probably enjoy this short video on how sea level is gauged if you haven’t seen it already. Thanks. Very interesting. What was new is that the density map has been built into GPS. It also means the sea level is different at places by up to 10 metres, depending on density of the mantle at that point and proximity to mountains or trenches for that matter. So when people talk about sea level changes, throwing in continental movements and rebounding from melted glaciers, it is very hard to give a figure for sea level or to be sure that a few mm change in the change in sea level is not local. Of course you also have to average over a whole day and phases of the moon and the orbit of the moon and joint effects like neap and king tides. All I can say is that the beaches I remember from childhood are completely unchanged, plus the ports I have visited from England to Russia to America. However we have had catastrophic Global Warming, melting sea ice and rapid ocean rises. So why can’t anyone actually see any effect in half a century? Because it’s not true. Kilauea has a constant flow, this episode would not be unexpected and is just a larger venting than usual. Have been near the regular flow of this one and also to the top of the crater to experience the regular thump as the surface crust breaks under pressure and sends a huge gob of lava skyward. The crater looked like several thousand watermarking BOS furnaces all dumped together. Near the top of the crater in Vanuatu. Not Hawaii. Proofreading is a must !!!!! Yasur? I’ve been wanting to go there for some time. Required a trip from the main Island, an overnight stay and drive up to the parking area. The final walk up to the crater rim was spooky. Narrow paths with rocks either side the size of half a house brick. These had once been molten and fallen out of the sky. The guide assured us that they could tell where the lumps were going to fall. A month after we got home, we read about a French tourist who was killed when hit by a piece of falling lava. Our trip was certainly an experience. When I got to the volcano it was raining and the crater was completely filled with steam and I saw nothing, just some rumbles. Nature hey? The thing I will always remember was the thump underfoot and watching as a hundred kilos or so of molten rock went straight up. I remember thinking that this couldn’t be done anywhere else because of liability issues. In Vanuatu you’re on your own and take full responsibility for your actions. European model predicts a two day blizzard in Vic and NSW from next Thursday, into Saturday night. GFS is not showing same, so it may fizz, but something to keep an eye on. It’s certainly going to get wintery cool late next week, and well into the tropics by weekend. Well if it is a blizzard it will be the first one I have seen here in western Victoria in my almost 80 years. I have seen snow once in the early 1970′s north of Horsham on the Plains and then it didn’t even hit the ground but only got down to a couple of metres above ground level before melting and disappearing. I believe there was a snowfall here in Horsham back in the late 1920′s or early to mid 1930′s. In the United States, the National Weather Service defines a blizzard as a severe snow storm characterized by strong winds causing blowing snow that results in low visibilities. To be a blizzard, a snow storm must have sustained winds or frequent gusts that are greater than or equal to 56 km/h (35 mph) with blowing or drifting snow which reduces visibility to 400 m or 0.25 mi or less and must last for a prolonged period of time—typically three hours or more. In the early 50s our family moved by car from Willaura to Rutherglen and the whole country was covered in snow. I didn’t say western Victoria. If you followed the link I posted and looked at the *ALPS* from late Thursday night, through into Saturday, you would have seen an ECL come ashore in EASTERN Victoria, and then tracking inland over the ALPS, to west of Sydney Saturday. Lows of that sort have no trouble at all producing copious snow and sustained winds above 56km/h—producing blizzard conditions. This mornings model run still has an ECL following the coast, but just offshore in this run, and high humidity over with low freezing levels in the Vic and NSW Alps, into Saturday morning, so winds may be lower and more coastal. But with a high squeezing isobars over the Alps. Not hard at all to see the potential for blizzard conditions developing. As I already said, it may fizz, but is something to watch. It certainly seems to be a pattern changer that will bring subdued temperatures and a fine tail wind for air travel. Though its not likely at the 850Hp. It depends on which way you are heading! There appears to be a strong correlation between a quiet sun and increased volcanic activity, possibly has something to do with electromagnetism. In your dreams, it’s cherry picking nonsense. … and I think it might be related to Jupiter. Taking this a little further ….. Despite her credentials in ‘Pure’ mathematics, there are no jobs in mathematics. The money’s in banking, stocks, directorships, top jobs and CO2 and having bffs like Green Malcolm. Who said competence was necessary for a job in energy when there is no glass ceiling. The banks have proven that. As another article says clearly, having equality in the board room has not improved ethics. Yes, there must be a way to turn the volcanic activity in Hawaii to advantage. There is no natural disaster which cannot generate profits or support windmills. Ha Ha Ha … how we laughed. ‘The architect of Malcolm Turnbull’s signature energy blueprint says there is no longer an investment case to build new coal-fired power stations in Australia ­because “the cost of coal is always going to be more than the cost of wind and sun”. But get the arrogance of the old hippie chick.” It’s not contentious at a factual level” That is a comparison between renewable and fossil. By the way I’m married to an old hippie chick Kerry, so it’s OK.
“In the real world, and on a coral reef, the concentrations are much much more dilute,” he explained. A massive sinkhole has opened up on a New Zealand farm, with a volcanologist saying it is the biggest he has ever seen in the country. The crack was discovered at Earthquake Flat, 15 kilometres south-east of Rotorua on New Zealand’s North Island. Vulcanologist Brad Scott visited the farm where it was discovered and said it would have taken decades for the underground cavity to grow, but was spurred on by recent heavy rain. “The largest I’ve seen prior to this would be about a third of the size of this, so this is really big,” he said. “The cavity would have been present from all the rainfall events over the last 40, 50, 100 years. Farm manager Colin Tremain said he could not believe the size of it. He said the area often developed sinkholes due to degrading limestone rock beneath the ground’s surface. Well that makes them smarter than some humans. I have been up and around the majority of the mountains in Germany. Spent years of time training in those mountains. During the summer the Bavarians keep their cows in the high pastures and as winter approaches bring them down. The grass is lush and green on those slopes and in the high Alpine valleys. I was constantly amazed by the places I would find cow tracks and patties up in the Bavarian Alps. Places one would never imagine cows would dare tread. They can climb a pretty steep slope as long as the ground is soft enough to for their hoofs to get purchase. We have a chain of burger joints named “White Castle here. It is the oldest fast food hamburger franchise operation in the US dating back to 1921. Famous for it’s small but tasty burgers fried in onions. They are the original “sliders”. The small patties preformed, packaged, and frozen come from New Zealand. I know because I picked up a reefer trailer full of them from the docks in Philadelphia, PA. The patties then go to local processing facilities where they are thawed, partially cooked and seasoned before being refrigerated and distributed to the stores. I know that because one of those facilities is right next door a terminal of the company I work for in Vandalia, OH (Dayton area). Sometimes I deliver to that terminal and then have to take a 10 hour break before going back to my own terminal. When the wind is right and they’re cooking those burgers I go to sleep to the aroma of cooking White Castle burgers. I’m so glad we don’t have things like that in Australia. One under Parliament House wouldn’t hurt. GM puts together their Corvettes at a factory in Bowling Green, KY. The plant is off I-65. It’s cave country. Mammoth cave is just 40 miles or so up the road. The many caverns in the area form in a layer of punky limestone that sits on a strata of harder rock and the limestone is dissolved over time by the water flow. Right next to the Corvette plant is the Corvette museum. It opened late in 1994 but was still under construction for at least a year after that. I remember seeing it as it was constructed many times since I often driver I-65. in 2014 a sink hole opened up under the main display area and eight of the cars went down in it. The hole opened due the same Karst Topography causes the caves to form. In fact is was a cave under the sky dome of the museum the roof of which gave way that caused the hole. Here is security cam footage of the floor of the sky dome giving way followed by another video showing drone footage of the aftermath. If the Yellowstone supervolcano erupts again it won’t matter. The whole world will be disrupted greatly. I was just at Yellowstone last July. What a wonderful place. My only regret is that I wish we had more time to explore but two Grizzly sightings in a single day was good luck. Hit all the high points but there is so much more. I wanted to find a decent sized piece of obsidian but due to construction the road back to the place where there is a lot of it was closed and we didn’t have the time to walk back there. I’m not going to lose any sleep over it coming to life and hope to get back there again soon. Just idiots touching wet paint. Snow fell across Hawaii’s Big Island summit peaks Friday, April 20. I tells ya … it’s a sign. Only solar panels can save us now. Kilauea is apparently a very attractive place both for tourists and as a place to live, though I don’t understand why anyone would want to live so close to it as to have even the tiniest most remote danger from it. I would think the State of Hawaii, being a very left leaning state, therefore sympathetic with the idea of holding everyone’s hand through life, would put a stop to building anywhere near such a danger zone. Eruptions don’t always give any warning and you could end up being at the apex of a lava jet going 50 or 60 feet in the air. But no, they spend their time as usual on human CO2emissions. I just love the red thumbs. They tell me I’ve hit the mark. Or have 3 viewers from Hawaii. It there is money involved their other concerns go out the window. I’m seeing reports of new vents opening up. It looks like things are getting worse but there are few details that mean much. After numerous small quakes there was also a 5.3 or .4 followed by a 6.9 earthquake yesterday. 6.9 means something for sure. I would surely like to know whether the eruption is driving the earthquakes or whether the quakes are driving the eruption. Or do they interact with each other in a deadly dance of their own. It looks like a worsening situation. Yes, and the leftists will also say global warming is causing freezing conditions in Europe as we speak. The nonsense keeps going on. I suppose if we do end up having a mini ice-age they will have a hard time convincing people to continue subsidising renewables at the expense of coal fired power stations in Australia while the rest of the world keeps on building them in the hundreds. Unless of course Australia is really the dumb capital of the world, which so far is a valid candidate. I do wonder how solar panels will fare under layers of snow and ice or smashed by hailstones? Likewise wind turbines when weighed down by ice? King Coal will be very welcome! Warmists really do believe that supposed global warming causes vulcanism. The reality is that the planetary and lunar forces that partially drive genuine climate change (apart from the Sun) also create forces on the earth that can influence geological activity. Here they blame volcanic eruptions for the LIA, solar influence unlikely mechanism. ‘Simulations using a climate model showed that several large, closely spaced eruptions could have cooled the Northern Hemisphere enough to spark sea-ice growth and the subsequent feedback loop. ‘It’s unlikely decreased solar radiation, a separate theory to explain the Little Ice Age, played a role, according to the researchers. At least two of the solar farms have recently been the subject of a massive investment under the Murray-Darling Basin Plan. Tens of thousands of dollars were invested to install new irrigation gates — which can cost an estimated $50,000 to install — and century-old irrigation channels were upgraded to bring the farms into the 21st century. Tallygaroopna diary farmer Natalie Akers lives close to one of the proposed developments and said she believed it was a waste of taxpayers’ money for the landowners to get grants to get irrigation upgrades, and then further Government grants to become solar farms. “We have the state and federal governments spending $2 billion up here to upgrade our irrigation infrastructure and set up our agriculture for the next 50 to 100 years. I don’t want to see solar panels being put on the irrigation backbone that’s setting up our future,” Mrs Akers said. Shepparton is seen as an ideal place for solar farms. “Shepparton used to be called the solar city, so we have lots of sunlight here,” said Geraldine Christou, director for sustainable development at the City of Greater Shepparton. At Lemnos, a small community just minutes from Shepparton, a large group of residents have banded together to fight the proposed solar farm development in their community. It is rare to get orchardists, dairy farmers, livestock producers, retirees and residents to agree on anything in a small farming community, but this group does not want a 100Mw, $175 million solar farm built on prime agricultural farm land. They have argued it should be built on more arid land that has not been upgraded under the Murray-Darling Basin Plan. Bernie McGill’s dairy farm will have a one kilometre boundary with the new solar farm and has concerns about the proposal’s flood plan the likelihood of hot winds blowing heat from the panel onto his farm and crops. “In the United Kingdom, they grade land one to five. One being the most productive and five being the least productive,” Ms Akers said. ***The planning panel that will hold public hearings in Shepparton from May 14-18. Delegates noticed that Germany was the only developed economy to speak over the two-days, and according to Harjeet Singh, global lead on climate change for NGO ActionAid, the only other major economies he noticed in the room were Brazil, India and South Africa. Insurance is a solution proposed by the biggest historical polluters in rich countries as an alternative to direct compensation, which they have fought to have excluded from the discussions. Developing countries’ main problem with insurance is that it is often too expensive. One of Germany’s contributions was from its development agency GIZ and described insurance for climate change damage as a “magic tool”. Singh said it was important “not to overhype insurance as a silver bullet that will solve all our problems”. Julie-Anne Richards of Climate Change Advocacy is in agreement. “Developed countries have this idea that they can perform magic,” she said. Insurance is unhelpful as a financial instrument because it transfers risk “from rich to poor people, and [climate change] is not their fault”. When asked what the greatest barrier to progress being made was, Richards responded that developed countries were “the number one and the only opposition”. “Climate Change is the single biggest threat to life, security and prosperity on Earth,” said UN Climate Change Executive Secretary Patricia Espinosa at the roll-out (LINK) of the report. While the 2008 financial crisis had a dampening effect on industrial activity, ***recent increases in economic growth have been accompanied by higher emissions of carbon. But the overall picture is rosier: By 2016, the EU had reduced CO2 emissions by around 23% compared with 1990 levels. So, even with the latest estimates, the EU is still on track to meet a target to make a 20% reduction by 2020. Roland Joebstl, policy officer for energy and climate at the European Environmental Bureau told Euronews: “Alarm bells went off when we saw the Eurostat numbers. “It’s proof that the time is running out to deliver the Paris agreement. European member states have avoided meaningful targets and strong instruments for 2020, and now are about to repeat the same mistake for 2030. “This happens despite the impacts of climate change are already being felt in flooding and freak weather events and new record high concentration of atmospheric CO2 every year. “It clearly shows how essential a speed-up of EU action and strict enforcement is. Brussels this week signalled it wanted to spend more on climate change commitments in the 2021-2027 budget period. Proposals published on Wednesday called for spending on climate adaptation and mitigation to increase to €320 billion. The European Commission has proposed to earmark a fifth of ETS auction revenue for the post-Brexit 2021-2027 central EU budget, for which it wants to raise climate-related spending by 5%. At the time of the Rio Earth Summit in 1992, the changing climate was a challenging, but solvable problem. 26 years later, the outcomes are becoming obvious and are we locked into a 1.5-degree average increase with two degrees almost inevitable. If there is no urgent action very soon, remediation will slip beyond our grasp. Prior to 1976 there had been no coral bleaching on the Great Barrier Reef. Now back-to-back bleaching means there is no recovery time leaving hundreds of kilometres of dead coral. But there is some good news with new solar powered agriculture and industrial processes being developed. And South Australia has become a world leader in transitioning to renewable energy. But with coral reefs dying before our eyes and climate changing everywhere fast, there isn’t a moment to lose. This is Tim Flannery’s appearance at the Planet Talks, part of Womadelaide, April 2018. Following the success of the Top 5 media residency for early career science researchers, the ABC has expanded the program in 2018 to include humanities. Five researchers will be selected for each program, designed to give participants training and experience in sharing ideas about their work and their fields generally. Applications close 9th May. Jodie Rummer was a Top 5 scientist in 2016. She describes the program and how it continues to be useful in her work. Yessir! All that white stuff in the northern hemisphere this last winter is a sure sign that irreversible heating is happening! Have you noticed how ABC and SBS keep running 2 year old file footage, and old quotes and stories about the GBR from 2016. It’s a katastrophe, dah weaf is doooomed! Meanwhile the northern GBR is well on the road to a full recovery, already, but ABC cameras won’t ever be showing that, nor will the academic money-grubs (respected experienced researchers) be admitting it until forced to. Did I see something about their ABC using footage of bleached coral in Samoa rather than the GBR as per the ‘news item’? And that white stuff isn’t done in the temperate zone of the NH yet. April UAH, no relief in sight from this oppressive heat. Yes it does seem weird. After all the news of a record cold spring, especially April across Europe, Russia and the USA I was expecting a down turn in the UAH Global temperature. Aloha! I live in the Puna District where the Leilani lava event has occurred. My wife and I have been here since 1997. While we live in the same district our farm(5 acres a mile from the coast)is not near the event in Leilani. We are the complete opposite side of the East Rift. 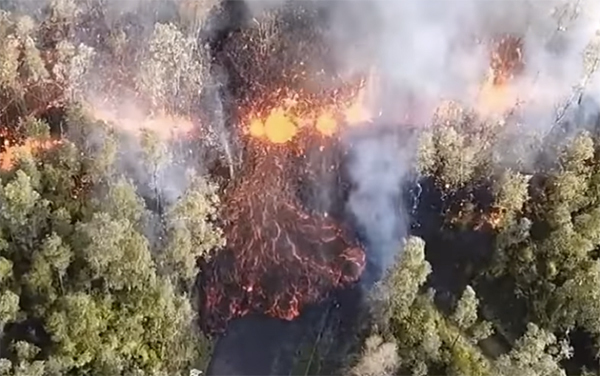 The Kilauea Volcano has had lava activity going back to the 1920s. The Pu’u'o’o vent has been the main source of lava flows since the 1980s. Two different locations. In 1960 the Kapoho Event started with fissures as you see now in Leilani. Both events are fairly close in their vicinity. The Kapoho Event 60 years ago created a crater known today as Green Lake. The Big Island, Hawaii, is the newest island in the State of Hawaii. These islands are part of the Sandwich Island Chain that has some 230 islands, but most people only visit four or five of the biggest islands, mostly Oahu where Honolulu is. After 20 years living here this is only the second major lava event. One other called Pahoa in 2014. Neither one were close to where we are located and had little effect. In fact we had more damage from our first hurricane in 61 years called Iselle, also in 2014. We lost power for 9 days and many more houses were destroyed than both lava events combined. At that time I was a producer for NaLeo TV and I did a video doc on Iselle so I saw all the damage and I shot all the 20-30ft surf the day of Iselle. Iselle was barely a Cat 1 hurricane, but the damage came for how long it stalled off the coast. In 1983 I was in Hurricane Alicia in Texas and it was a Cat 4 and did massive damage to Houston. Even Harvey in 2017 did massive damage to Houston. Last month in Kauai there were 530 homes damaged or destroyed due to floods. It would be unusual if this lava effected 100 homes. If you consider locations in the world where you can live that have the least risk then half the world needs to move! Between hurricanes, earthquakes, tornadoes, floods, fires, cold there isn’t a lot of safe choices on planet Earth. The other considerations are quality of life. I will bet those living in Pyangong, North Korea or even Caracas, Venezuela would prefer the Hawaiian volcano! Crowded polluted crime ridden cities are no prize either. In 20 years we have had no burglaries or assaults, quite peaceful. Then you have to consider cost of living. When you live in Paradise you can live off the land 365 days a year. You can build houses with T-111(plywood siding) and metal roof. If you build right you do not need air conditioning or heating. You can even live in a big tent if you like. Consider farming. Almost no expense to grow food. In Hawaii it rains almost every day and plenty of sun as well. On the Big Island there are no freeways. No big city crowds or crime. Maybe one murder per year! Property tax on a five acre ag property with two houses and a barn a mile from the ocean is $463USD a year. That same property in California would cost $30,000 a year to own. If you are off the grid you don’t even have utilities. Since most of our income was derived from shipping ag products outside the State to the mainland and Canada our excise taxes were 0.05%. The Hawaii sales tax is 4.67%. In California sales tax is closer to 10%! Hawaii Income Tax is around 7%. California more like 20%! Hawaii makes California look like Venezuela. Sadly the one big drawback is that Hawaii is run by mostly Democrat politicians like California, but so far Hawaii has a lot less fallout than California. Hawaii also has a huge Asian influence and foreign investors mostly are Asian and they bring a lot of money into Hawaii. So we bought our farm in 1997 for $195,000USD, which included houses and an ongoing ag business that in those days grossed $160k annual. What we would have paid to live in California in a similar locale and acreage for 20 years would have costs us five times as much as we paid in 1997. Mainly though the quality of life would have been 100 times less and the views not nearly as scenic and awe inspiring. You cannot always judge people’s choices based on your own brilliance!